Yeah. 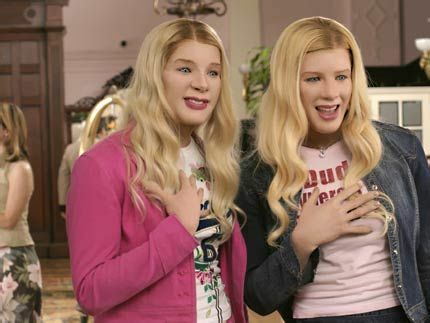 I don’t get it either but The Hollywood Reporter has announced that The Wayans Brothers and Sony are developing a sequel to their 2004 comedy “White Chicks” More info after the jump. When I first read this news I was pretty much dumbfounded and I couldn’t wrap my mind around why this was going through. While reading the article in hopes of finding out a reason I read about how the original film was a surprise hit and grossed almost $70 million from a budget of around $37 million. So, it seems that this is enough to get a sequel greenlit. Sadly. Keenen Ivory Wayans will be directing meanwhile all three of the Wayans Brothers will be writing the script. The plot for the new film is currently being kept under wraps though. If you guys remember the first film was about two disgraced FBI agents who go way undercover (you can guess what they do) in an effort to protect some hotel heiresses from a kidnapping plot. When I read that they were going to make a sequel and that the plot was being kept under wraps I couldn’t help but think of the title “White Chicks 2: White Dudes” I really, really hope I’m wrong with this prediction.